A multiplicity of factors converging together suggest the long term/post-acute care (LTPAC) provider community (e.g. nursing homes, behavioral health facilities, home health agencies, etc.) will accelerate in importance within the healthcare ecosystem during the next few years. The challenge for many LTPAC providers in this emerging environment will be to advance their clinical health information technologies (health IT) capabilities in order to "play" with other providers in the healthcare "sandbox." This book is designed to assist LTPAC leaders in identifying and exploring the array of critical issues one needs to consider in order to operate within an advanced clinical health IT ecosystem. 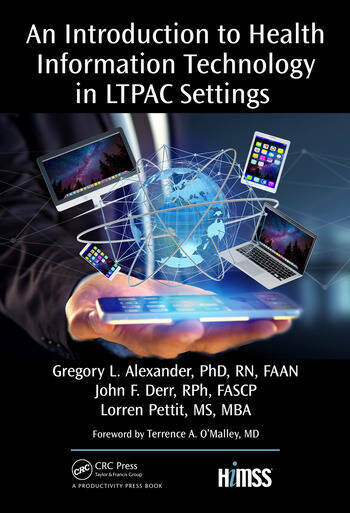 This book surveys key issues surrounding the use of clinical health IT in LTPAC settings, to include providing readers with a suggested strategic plan and roadmap for selecting and installing digital health technologies in LTPAC organizations. Though the focus of the book primarily centers on the U.S. LTPAC provider’s experience, the authors also spend time addressing global and future LTPAC considerations. As Vice President, HIMSS, Lorren has oversight of three key efforts for HIMSS: thought leadership research, HIMSS’ reach to the Long Term/Post-Acute Care health IT community, and Connected Health technologies (e.g. telehealth). Lorren has been a health care researcher and strategist for more than twenty-five years, with experience in health care operations and corporate planning. He has held strategic planning and marketing roles in various acute and non-acute health care settings, as well as within the hospital group purchasing and hospital services industries. A native of Canada, Lorren completed his undergraduate work at the University of Winnipeg before completing a Master’s of Science in Gerontology from Baylor University and a Master’s of Business Administration from the University of Dallas. He served on the faculty of Indiana University teaching Medical Sociology and Gerontology for the past eight years and currently resides in the Nashville, TN area. Dr. Alexander has a broad and extensive background in human factors, informatics, gerontology, patient safety and quality improvement. He is an appointed member of the National Quality Forum HIT Patient Safety Committee, and has participated as a member of the Alliance for Nursing Informatics (ANI) as well as representing ANI (sponsored by HIMSS and AMIA) on the Long Term and Post-Acute Care (LTPAC) Collaborative which plays an important role in monitoring health IT policy initiatives, providing comments for current health IT initiatives, and disseminating important roadmap documents designed to provide policy makers information about current health IT developments in the LTPAC community. In the past, he has played a large role in the development of meaningful use standards for information systems, which are being deployed now by the Office of the National Coordinator for Health Information Technology. For example, he was Co-Chair of the Care Management and Health Records Technical Committee under the Health Information Technology Standards Panel which recommend initial drafts of meaningful use standards. He has been Principal and Co-Investigator on several federal grants designed to build a research trajectory investigating impacts of technology on quality of care in LTPAC settings. He has over 80 peer reviewed publications about this work. Greg created a survey currently being used to measure trends in IT sophistication in a national sample of nursing homes over 3 years (AHRQ). Trends are being evaluated against national quality measures to determine technologies impact on care. His goal in the national study is to develop visualization techniques to evaluate analytical trends in technology and quality measures. He is a co-lead on a national demonstration grant funded by CMS investigating the impact of health information exchange between nursing homes and hospitals. Goals of the CMS grant are to reduce avoidable hospitalization. Mr. Derr has over 50 years of executive experience in almost every facet of healthcare having been the Director of Strategic Planning and Product Development for ER Squibb; VP & Division Director for Siemens Ultrasound & Nuclear Medicine; SVP of National Medical Enterprises International (Tenet);Division Manager Kyocera US Orthopedic Implant Company; and most recently, SVP CIO Golden Living, LLC LTPAC Provider. He has been COO, Founder, & CEO in three healthcare startups: Clinical Chemistry; Direct Marketing Relational Databases: and Dermatological Lasers. In 2002 he was the EVP of the American Health Care Association representing LTPAC when the Executive Order was signed to digitize healthcare and he was asked to coordinate LTPAC by the Secretary of Health. Derr has been directly involved in the development of the new healthcare initiative as a hands-on Provider Healthcare Executive; Health IT Developer; Strategic Clinical Technology Advisor on Federal, State Committees and CMS Grants; Clinical Technology Strategic Advisor for Health IT Developers and Provider Corporations; and in being directly involved in assisting Professional Associations in their strategic planning to educate their membership both as a full time Executive and on their clinical technology Committees. In June 2016 he completed a seven-year term on the HHS Federal Advisory Committee on Health IT Standards and remains active as a member of the Joint Policy and Standards Taskforce on Patient Engagement. As a Veteran and Retired Navy Captain of the Line he served on two VA Oversight Committees. He has been a member of HIMSS for almost 20 years and most recently involved in the HIMSS LTPAC programs and as the co-Chair of the HIMSS LTPAC Roundtable. He is a graduate of the Purdue University School of Pharmacy where he was awarded a Purdue Distinguished Aluminous in 2006. He has been published in numerous journals, and is a regular speaker on LTPAC.